Using AWS allows us to work with some of the biggest brands on the planet and meet their enterprise-class availability, scalability, security, disaster-recovery, and business-continuity requirements. Unified delivers software and services to connect marketing data sets and optimize investments across the customer journey. The company’s Software-as-a-Service (SaaS) platform helps media buyers and brand managers direct and analyze social media spend across all social media channels. Using Unified, customers can coordinate their social media campaigns and transform marketing data into actionable intelligence. Needed to ingest and process large volumes of advertising and marketing spend data every day, as well as perform transformation and analysis on that data and store it at rest. Need to quickly scale its platform to support significant anticipated business growth.Sought an effective business-continuity solution. “In the unlikely event of a catastrophe, we need to be able to bring our entire operating environment up as quickly as possible, because our customers depend on it,” says Shawn Douglass, president of software and CTO at Unified. Needed to provide a secure solution to its customers, without having to develop a homegrown system. 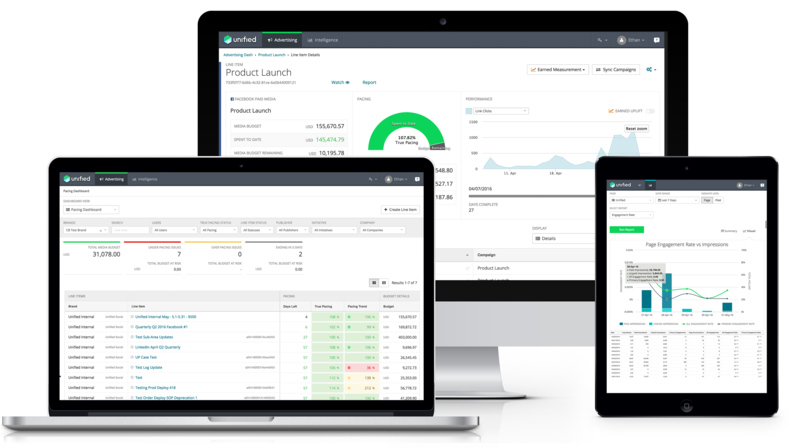 Unified developed and launched its SaaS platform on the AWS Cloud. The platform ingests terabytes of social media marketing data daily from Facebook, LinkedIn, Twitter, and other social media sites. The data is ingested into Amazon EMR, a web service that uses the Hadoop/Spark open-source, big-data framework to process data. After undergoing an extract, transform, and load (ETL) process in three Amazon EMR clusters using the Spark framework, the raw data is fed into Amazon Simple Storage Service (Amazon S3) buckets for storage. The company also uses Amazon Elastic Compute Cloud (Amazon EC2) Spot Instances to cost-effectively manage its EMR clusters. Data also flows from Amazon EMR into Amazon Redshift, a data warehouse that Unified uses for analytical reporting. The data is also sent to Amazon Relational Database Service (Amazon RDS) for real-time reporting capabilities. Unified stores half a petabyte of data in Amazon S3 and 15TB of data in Amazon Redshift. Unified presents data to its customers via a real-time view of running campaigns and an analytical dashboard application, which customers can query for insights into their social media advertising and marketing investments. Unified takes advantage of a combination of AWS CloudFormation templates, AWS Lambda serverless compute resources, and Amazon S3 data replication to ensure performance, availability, and business continuity for its platform. The company also locks down access controls using AWS Identity and Access Management (IAM) profiles and AWS Key Management Service (AWS KMS). To learn more about how AWS can help you manage your big-data platform, visit our AWS Big Data Solutions details page.